Recently I have had several conversations with people about tithing. Several women shared that they are convicted to tithe a full 10% of their money, first thing, and they have seen time and time again that God has been generous back to them. Another friend confided that every time she does not give from the top of her paycheck something ridiculous always happens so that she has even less money. - We received notice that our mortgage was going up each month because of escrow. - I was diagnosed with gestational diabetes, throwing a wrench into our meal plan and grocery budget. - My husband had to cancel a dental appointment because we couldn't afford the work. Maybe we were given new difficulties because we don't tithe 10% of our paychecks but I don't think that's how God works - at least not in our lives. I mean, at the exact same time, look at the ways He was inspiring the Body of Christ to be generous! Look at the ways He came through for us! BUT, I do trust those women in what they said. I do believe that that's how God works in their lives. This was probably already made pretty darn clear in the FH&SP series, but being this poor can be incredibly humiliating at times. But like I also said in the series I really do think that these are the sufferings and sacrifices God has given to us. They're not going to look exactly like yours nor will yours look like mine. 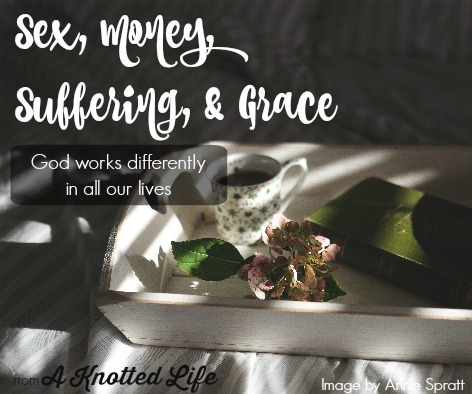 I wholeheartedly believe that God works differently in each of our lives according to what we need for sanctification. Maybe that friend of mine needs to be stripped of her love of money and needs to learn to submit to and trust in God. Or maybe that's not it at all - I'm just guessing to illustrate here. But for me, I think I need to be stripped of my pride. I need to learn to put others first. I need to love God above my husband. At least that's what I've figured out so far, I'm sure there's lots more to unearth. Right now my heaviest crosses are the financial worry, the physical toll all the pregnancies have taken on my body, and the fact that natural family planning in my marriage will be nothing more than complete abstinence for several (many?) years. So I guess I need to work on chastity, too, probably. Are these things fun? Uh, no. Are they easy? Nope, usually not and especially not at first. But these crosses are mine and it's time to stop pretending like I should have what other people have (like savings accounts and normal fertility) because that's not what I need right now to grow in holiness. A recent article posted at Aleteia says with a great deal of charity and compassion for people just like me, "It can’t be acceptable, from the Catholic point of view, that the marital act is so strictly bound by economic status that husbands and wives can enjoy the divine gift of sexual union only if they can afford the result. The Catholic teaching is not for the middle and upper classes alone." Do you know what I thought when I read that? "I appreciate what you're saying, but don't take this away from me." If this is my cross, if this is the means that God has chosen to sanctify me then please don't take it way. Don't find an easy out option for me. I don't need a loophole; I need grace. I need the grace to turn to God in prayer. I need grace to not believe the lie that my husband doesn't love me just because we can't be intimate. I need grace to do what I need to do to heal and strengthen my body. I need the grace to stop worrying about how dingy and shabby the carpet, bathrooms, living room furniture, and kitchen cabinets look and start being grateful. As my Ugandan priest told me, materialism is one of the greatest weaknesses of Catholics in America. My bathrooms may be dated, small, and ugly but I have two of them, with hot running water, and they're air conditioned. As an aside, if you want to feel like an ungrateful jerk, try confessing your jealousy of everyone else's shiny swagger wagons to a man who as a boy had to hide in the fields of a banana plantation, ended up being bitten everywhere by fire ants but couldn't move because otherwise he'd be killed or kidnapped by the soldiers who had arrived at his home during a civil war. So materialism, jealousy, ungratefulness - yes I need to work on those things, too. And because of the lot in life that God has given me I can work on them. This vocation - my husband, my kids, my home - this is the path before me and the Good Shepherd is leading me so I fear no evil. The trick is to only remember that His rod and staff are there to guide and save me, not to punish me. Your path may look a bit different than mine - your verdant pastures may have different consolations and there may be different rocks and brambles along your way - but I trust that's how it should be. Thy goodness fails me never. Amazing post. Praying for you always, Bonnie. Please pray for me also. I really need those prayers. Love you. Of course, Mia Jude. I love you. Geez, you are on fire lately. Thanks for sharing. You really are on fire!!! Thanks for speaking do honestly here. I'm bookmarking thus post because I need to read and reread it a few more times. This was so good, and true. After 6 in 6 years, we had to take the "periodic" part of out of NFP abstinence. It's really really hard, but like you I know it is what was chosen for me. That doesn't make it easy, but it helps. At the risk of maybe repeating previous people, are you aware of and able to access Marquette for nfp? We used it successfully for a few years while needing to have a break after our first five kiddos, after other methods proved to be much less practical for us. Anyway, I'd be happy to share with you privately and maybe can help you get started with it later if you want to know more. You are the bees knees. For real. Also, as still pretty new converts, my hubs and I have been looking in to what the Catholic Church teaches on tithing. And just as you said in your FB post, it does not state that it must be 10%, or any certain amount. Anyone reading her consistently can see that you tithe way more than 10% of your LIFE. I think there's this very real temptation to diminish or dismiss the crosses of others, or to compare them to their own. I'm so guilty of thinking, "all my worldly goods for another baby". My savings account and cars seem so pale in comparison to actual people in my family, but I think my unique cross is about pushing that truth into the marrow of my soul. Thanks for sharing your cross so openly and giving someone like me a little more compassion and insight into a very different struggle. I love the comments about your Ugandan priest....I think we have a really distorted definition of suffering sometimes. Back whe. raising a large family on one income was more the norm, struggling financially was also the norm. My 92 year old neighbor talks about those days sometimes...about canning produce in the 90+ degree Arkansas summer "not because it was a trendy thing to do, bit so we could eat that winter", cooking many pots of beans for dinner...and she says, "We didn't think of ourselves as poor. That was how it was for everyone." Not sure where I am going with this, except that, for me,,,I'm not sure my own struggles are quite as bad as it feels sometimes, they just look that way in comparison to the lifestly others are often living around us. Bonnie, you brought me to tears with your heartfelt and beautiful post. Thank you! My mind is kind of like "whoa" over it because it is challenging to me in lots of ways (good thing). Like, perhaps my cross is I am not intimate with my husband for years or longer... my immediate response is "but God wouldn't do that!!!" However if it's the path to sanctification, perhaps He would. This stuff is really hard for me because I detest the cross-carrying part of our faith (though I'm working on it). Love that you always write from the heart. If you need some advice/tips/ just need to vent about GD.. let me know.. been there . I think tithing may in some ways be seasonal - as in a season of life thing. When you are older and the kids are older maybe then you can teach CCD, or help the youth group, or give or your time and talent in some way - which is also tithing. Just praying for your parish is also a giving or yourself. Don't beat yourself up too much about it! When you are able to contribute financially, I'm sure you will. Bonnie, I have quietly read your blog for a while now! I so appreciate your authenticity in showing your life, the beautiful and the difficult. You are a special soul and truly a breath of fresh air. Thank you Bonnie for your posts! My favorite priest and spiritual advisor is from Nigeria. Man, he has put so much into perspective for me as well just telling me some hard statements that others have refused to do. He greatly helped my husband during our first period of abstinence. Father Valentine really helped us to see that NFP might be what gets my husband the Grace he needs to kick list in the balls ;) (sorry but that makes me giggle way too much). We currently do not tithe 10% because of some financial hardships thanks to a cross country move, doctor bills, and several months of incomplete pay. Yikes it's been rough for the last 5 months. It is a goal to get our 2% up to 10% but right now it's not possible. Our priest knows this and understands. He checks in periodically to keep us motivated in paying down debt and sticking to our budget. I've learned that giving my time and talent has actually been incredibly beneficial to our parish and those around us. *lust not list and sorry for the million other typos! So good for me to hear this right now! Absolutely beautiful. I've said this over and over, but I so appreciate you sharing these things with the internet (and me, of course). I, too, don't believe that God works like that. Prayers for you during this pregnancy! I had heard the Catholic school tuition is part of the 10%. There is a season for everything. You are living God's plan. Blessings. Catholic school tuition is usually priced under the cost of what it costs to educate a given student, and the shortfall is made up with donations and fundraising. So paying tuition is just paying your way at a private school, not supporting the basic needs of the parish. However, the Catholic Church does not require a 10% tithe, merely that we be cheerful givers. So for some people, it's better to stop at a cheerful 2% than continue onto a resentful or impossible 10%. For families like Bonnie's, who have only a handful of luxuries to make the tight budget feel doable, I don't think they should cut back those things to donate more. People get burnt out living close to the edge, and it's not good ministry to increase that burn out for what is a pittance to a parish. However, for those who are nowhere close to the edge, donating more ought to come long before satisfying every want (summer camps, newer cars, better phones, decorating the house, etc.). So, in short, I'd say tighten the belt, but not past the point of cheerfulness, which is going to vary based on temperment and circumstances. Wow. This is the best thing I've read in a long time. I can't tell you how frustrating it is to listen to people complain about how they have to "budget" by giving up a few Starbucks or Target runs each month or by cutting back on the wine budget...when compared to choices like "do we keep the water on or go to the doctor?" it seems like fake budgeting to me or a form of complaining. Still again the choice of which bill we pay compared to, "Do I scream from the fire ants or lose my life..." it all pales in comparison to so much suffering in the world. We are so spoiled. We can't compare crosses or graces. So challenging to stay in our own lane and listen to what we know is true without complaint or jealousy. We used to be the broke people in our circle, and then we moved a few hours south, and now we are among the most affluent in our new circle down here. Perspective! I find myself being the person who says something that may feel thoughtless to the family that is getting by an income that looks impossible to me, but I don't know if it would be fair for people to hold it against me that I consider it normal to wash my clothes with warm water when they are especially dirty, or to use the dryer for almost everything, or to stock up on groceries every two weeks instead of going every few days as money trickles in/so nobody eats up a week's worth of food in two days. But to some people I've befriended here, all this makes me look like a high roller. None of us are drinking Starbucks or idling through Target, yet I still look like I have no business worrying about money or wishing we could afford to do X, Y, or Z. But I know that if I wasn't paying attention to all the little things, we would quickly be in debt. I was thinking as I read this that you are working toward Wisdom. Is Wisdom another word for sanctity? Two years later, and this post was EXACTLY what I needed to read today. Exactly. So thank you for your honesty, your grace and your love of God.